About "Find the maximum and minimum value of quadratic function"
The graph of the quadratic equation will always be a parabola which is open upward or downward. The quadratic function f(x) = ax² + bx + c will have only the maximum value when the the leading coefficient or the sign of "a" is negative. When "a" is negative the graph of the quadratic function will be a parabola which opens down. The maximum value is "y" coordinate at the vertex of the parabola. 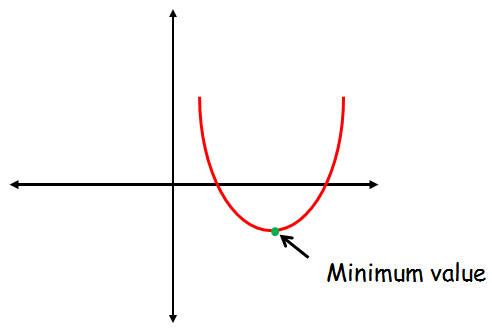 There is no minimum value for the parabola which opens down. The quadratic function f(x) = ax² + bx + c will have only the minimum value when the the leading coefficient or the sign of "a" is positive. When "a" is positive, the graph of the quadratic function will be a parabola which opens up. The minimum value is "y" coordinate at the vertex of the parabola. 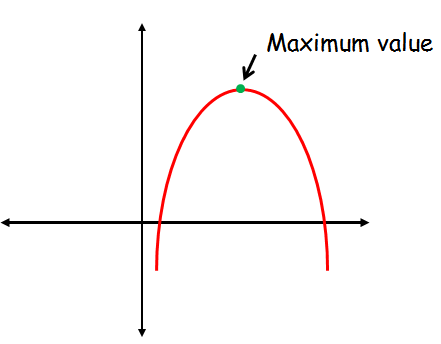 There is no maximum value for the parabola which opens up. Find the minimum or maximum value of the quadratic equation given below. Since the coefficient of x2 is positive, the parabola is open upward. So, the function will have only the minimum value. Hence the minimum value is -9/8. Since the coefficient of x2 is negative, the parabola is open downward. So, the function will have only the maximum value. Hence the maximum value is 33/2. Hence the maximum value is 245. Hence the minimum value is 5/3. After having gone through the stuff given above, we hope that the students would have understood "Find the maximum and minimum value of quadratic function". Apart from the stuff given above, if you want to know more about "Find the maximum and minimum value of quadratic function", please click here.